Are you private label brand owner with a kid’s clothing collection? Then you need these three trends to make your brand a favorite for the parents that come to your store. Want to know what they are? Take a look at this blog now! If you are private label brand owner and looking to revamp your kid’s clothing collection, then you have reached the right destination. We are going to let you in on some of the latest trends in the children’s collection for the coming Fall-Winter so that you can introduce it with some assistance from your manufacturer. Each of these trends should be available with the top private label wholesale clothing manufacturers so you really don’t need to worry about finding them. And in case you do not, you can always find a new manufacturer. This one’s a casual rendition of the formal suit, so we decided to call it the Friday suit, because Friday dressing – get it? It’s casual and funky and comes with all the signs of a great apparel for kids. Generally, you shall find it in neutral colors and contrasting it with lighter shades is kind of the best way to go about the whole thing. You can also find light pin stripes that are going to really cool when paired with boots and the likes. A refreshing change of pace from the cute and cuddly to the suave and stylish, suede jackets are a wonderful addition to your private label store’s kids section. These have a panache that is going to stand out and make the kids that buy their clothes from your store look so much better. And is not that what we all want? Suede jackets have a fierce sense of fashion and can be very flexible when it comes to pairing – from formal wear to casual wear and even shorts and t shirts. Ultimately it all depends on how you make your kid carry it! If you thought check pants are off, then you are so wrong. It is back on and it could not have had a better rendition. Check pants make a great addition to your overall children’s wardrobe section and that is what makes private label wholesale clothing manufacturers your need of the hour. When it comes to suggestive style, you can always ask your customers to pair check pants with white t shirts and the likes. Just do not go for patterns on top and at the bottom. Interesting right? 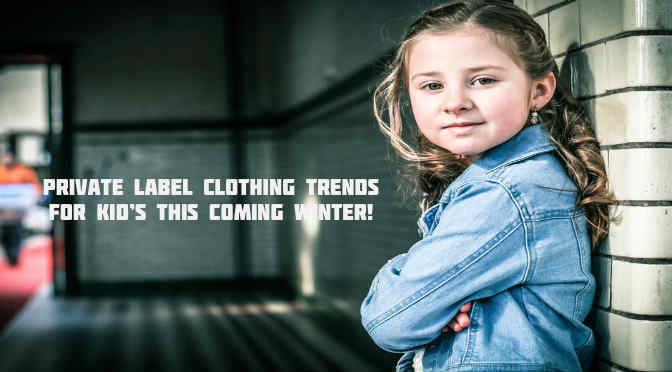 These are the 3 trends that your kids clothing manufacturers should have for your private label children’s brand to take off. So, what are you looking for? Get started now and make sure you have all three of the collections as soon as possible! Previous PostThe Ultimate Guide To Compression WearNext PostHow Workout Shoes Enhance Your Overall Performance!